Bilbies don’t lay Easter eggs and they don’t taste like chocolate. Bilbies have massive ears that can change like Transformers – either flat against their body, at right angles or folded in half. That’s because they can’t see well but they have the best hearing in the land which allows them to sleep all day and work all night - using their amazing ears to listen out for food. Bilbies are even more unusual because they have a backwards-facing pouch. This is a very useful adaptation because it means that when a female is digging away at the soil to hunt for food or build a burrow, the soil does not fill up in the pouch. It just means you can’t jump in and get a lift to school with them. 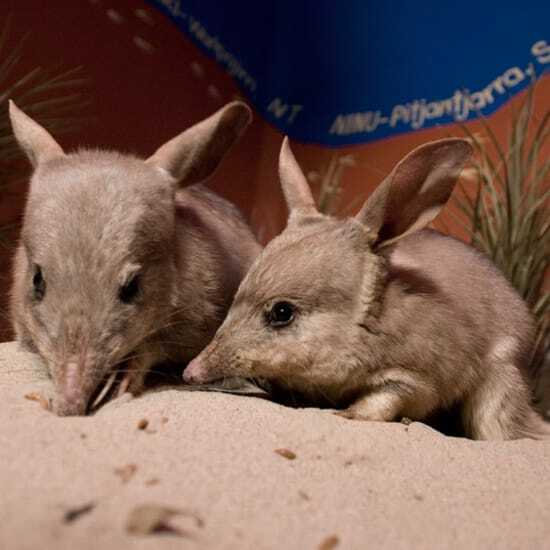 A hundred years ago, Bilbies were common across 80% of Australia – from the desert to the beaches. They have been hit by changes to habitats from humans knocking them over and they live in habitats that are broken up. They live in the Tanami Desert of the Northern Territory, the Gibson and Great Sandy Deserts the Pilbara and Kimberley regions of Western Australia, and the Mitchell Grasslands of southwest Queensland. Bilbies have beautiful fluffy, silky grey fur and a long snout with a slender tongue. They can get up to half a metre in length, 30cm tall and weigh 2.5kg. They have amazing burrows which they dig, which are spirally magical mystery tours that can go down 2m – and they have about a dozen of them each. Bilbies are very important “ecosystem engineers” in the iconic Australian desert. They break up the soil when they poke their nose in, and make scratchings, and dig long bull-dozing tracks and burrows. They improve the soil health by turning over and mixing organic matter. By breaking through the hard soil, water can get in deep which is great for plant life – in fact where they dig may be the only place where water can actually get through because so many Australian soils are water repellent. Bilbies eat pretty much anything - bulbs, fruit, seeds, fungi, insects, worms, termites, small lizards and spiders. They don’t drink much either – getting their water through their food, which means they can survive in the desert pretty well. It is amazing that such a cute animal could cope in such harsh conditions as the desert. They keep cool in the hot Australian summer by using their strong claws to dig spiral burrows underground, their large, hairless ears let heat from their body escape and they emerge to find food in the cool of the night. Bilbies breed all year round. Their gestation period is only 12 to 14 days and young, between one and three in a litter, remain in the pouch for around 80 days, and are independent about 2 weeks later. The main thing putting Bilbies on the edge is predation by feral cats and foxes. This, coupled with their habitat being taken over by humans, has led to their demise – and the extinction of the Lesser Bilby. They live in the less fertile areas of Australia as their old homes have been turned into farming land. We want to continue to breed them at Taronga Zoo and get them into some protected habitats where foxes and feral cats can’t kill them and they can thrive. We want to help bring back the Bilby to NSW. • $24,000 could pay for approximately 200 metres of fencing for a Bilby breeding facility at Taronga Western Plains Zoo which will keep them safe from the predators. Taronga Conservation Society Australia is bringing partners together to bring this project to life, given their long history in helping the Bilby.